Retail industry or supermarket industry, we have some great promotional Customised Trolley Coin Keyrings that are perfect for gaining brand-awareness for your Company. Our Customised Trolley Coin Keyrings are keyrings that hold a £1 coin for you to use in your trolley at the supermarket, as well as reaching you printed up with your personal business details and company logo. Don't go shopping without our Customised Trolley Coin Keyrings today! To find out more about our Keyring Department click here. To find out more about our Customised Trolley Coin Keyrings click here and fill in the contact form and we'll get straight back to you. 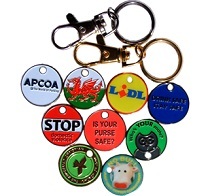 Other promotional and personalised items besides our Customised Trolley Coin Keyrings click here.